Auburn is located in the heart of Lee County, Alabama and is known for being the largest city on the eastern side of Alabama. Estimated population of Auburn is around 60,000 people. Auburn is known for being a major college town. Nestled within the limits of this town is Auburn University. This is one of Alabama's fastest growing cities and it borders Pelika to the north. As with any southern area, Auburn is known for it's warmer climate through out much of the year. Winters are deemed fairly mild while summers can be hot and muggy. Natures loves will feel right at hoe in the spring and all and the temperatures are milder than other times of the year giving this area the right balance. However being in the deep south this area is also known to frequent thunderstorms. Look for an apartment about 3 months before you want to move. Sometimes even as far out as 6 months ahead. Being a college town there is a lot of competition for units. Apartments have a tendency to stay close to capacity during the school term. By applying a few months before the end of each semester you have a better chance. With Auburn being a large college town, you can imagine that apartment complexes are in abundance. However this creates quite a competitive environment when it comes to the application process. Landlords are easy to work with since they are used to the every changing college environment however they will be selective in choosing a tenant. Landlords like their units filled without any complications to worry about. Auburn has a wealth of public transportation vendors at your disposal. Gotcha Ride is the cities only 100% electric transportation service that is driven by Auburn University students for students. They work for tips only. In addition there are numerous taxi services available. Auburn has numerous sporting events throughout the year. In addition the nightlife is on fire as you can imagine. From food and drinks to music and dancing, this town has it all. There is literally something for everyone no matter what your preference is. Although it might not have a country wide reputation, if you ask any local which attraction is a must-see in Auburn, they will all tell you to pay a visit to Toomer’s Corner. Here, you'll find Toomer’s Drugs, a store that has been in business since 1896. This business is a local landmark, and the lemonade is considered by many to be the best money can buy. Heading down Old Main and Church Street is a great way to see some of the most historic buildings in the city. In particular, visit the Holy Innocents Chapel. The Church was built in 1886, and is one of the most well preserved historic buildings in the city. Acre is well known as the best local spot to take a date that you're trying to impress. It’s rustic, southern and sophisticated all at the same time. With live music, art-filled walls, and a café-atmosphere, Amsterdam Café is not to be missed. The Hound is a local institution on Tichenor Avenue, and is perhaps most famous for it's burgers and it's southern twists on American classics. There are a lot of great casual spots to eat in Auburn. The Barbecue House on College Street is a fantastic little joint where you can pick up a quick sandwich in a family owned locale. Auburn is a college town, and the support for the Tigers football team is incredible. Nowhere is this on fuller display than in the numerous bars that throw parties for each and every Tigers game. Sky Bar is just one example of the many great places to head to on game day. To really understand how deeply entrenched the football culture is, pay a visit to 17-16, a bar that is actually named after a score in a famous football game. Other popular bars include Bourbon Street and the Bank Vault. Although they all have slightly different atmospheres, the importance of game day is clear in all. The Judy Collins Smith Museum of Fine Art is one of the most important cultural institutions in Auburn. This museum is affiliated with Auburn University, and serves as a cultural hub for the city, and for the artistic community on campus. With a collection of over 2000 pieces, a café, and rental facilities that are available for a variety of events, the Museum is an integral part of the Auburn landscape. There are both college and community theatre groups that also produce live theatre in the city, including the “Best Little Theatre in Auburn”, the Placer Community Theatre. The Hound and the Bank Vault are just two of the local bars that regularly feature live music as well. First of all, the most important annual events are the Auburn football games. Nothing else tends to bring the whole town together for fun like the games. There are other annual events centered around the football team, such as Football Fan Day, which allows fans from town to meet the players, coaches and cheerleaders from the team each august. There is also A-Day, which is the final scrimmage of the football team each spring. For an event that isn't centered on football, Christmas is a good time of year! The Auburn Christmas Parade is an annual event that goes right through the downtown heart of the city. The primary shopping mall in the city is the Auburn Mall. The Anchor stores are Belk, Dillard’s and JCPenney. There are also a number of restaurants that stay quite busy inside the mall, including an Applebee’s. Downtown Auburn is also a lovely place to shop, especially if you prefer to give your business to independent shops. Opelika, the twin city to Auburn, also has a great downtown shopping district with a very similar vibe, featuring mostly smaller independent shops. Around the University you will find a lot of essential stores that provide the day-to-day necessities that students and residents need to get them through the year. The Auburn Tigers are part of almost everyone’s life in Auburn. Kids growing up in the city hope to be a Tiger someday, and almost every person in town is a diehard supporter. The Tigers have strong football, baseball and golf programs, but are competitive almost across the board in both men’s and women’s sports. The athletics program also has a long list of very famous alumni. Among those (even though he didn't graduate), is NBA great Charles Barkley. Bo Jackson, one of the most successful dual sport athletes of all time went to school at Auburn as well, as did Cam Newton, current starting quarterback for the Carolina Panthers. You don't have to go far from Auburn to visit some spectacular outdoor sites. Chewcacla State Park is home to a very beautiful waterfall, and the hike through the park is easy enough for most people to tackle. Golf Digest has recognized Auburn as being one of the best places to golf in the country. Indian Pines is one of the best examples of the great golf in the Auburn area. The largest park within the city itself is Kiesel Park. This has a short trail that is perfect for those who want to get out and about without the rigors of wilderness hiking, and is also dog friendly. 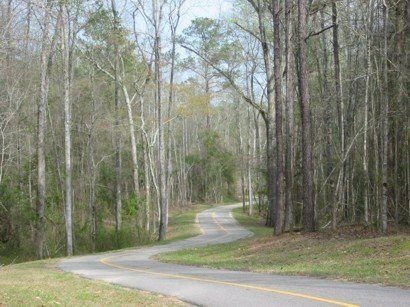 The park is more than 157 acres in size, providing a perfect getaway right within Auburn.